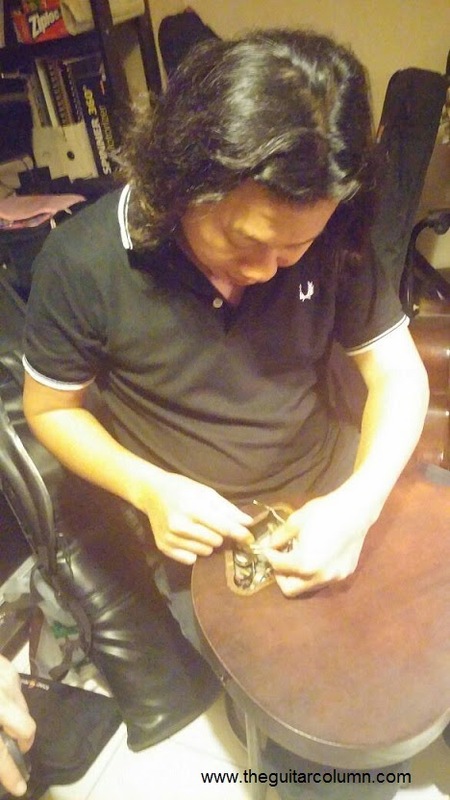 In this fifth and final installment of Refinishing My Les Paul BFG, I decided to let my good buddy Arnold San Juan put his remarkable skill with a soldering gun to good use and do a complete rewiring of my guitar. A sound recordist and mixer in the film industry -- twiddling knobs and faders of various persuasions -- Arnold is also remarkably adept at guitar electronics and building effects pedals. 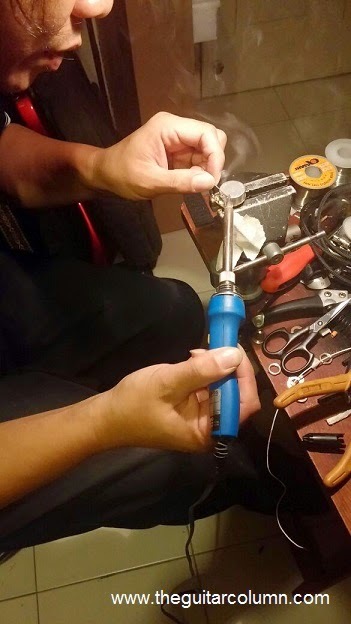 And his skill with a soldering iron has left many local electronics gurus slack-jawed in awe, he'll be the first to admit. Jokes aside, this guy really is one of the best. The Les Paul BFG comes with one of the strangest electronics configurations of any Les Paul model. With a P90 in the neck and a Burstbucker 3 in the bridge, both pickups have separate volume controls but a shared tone control. 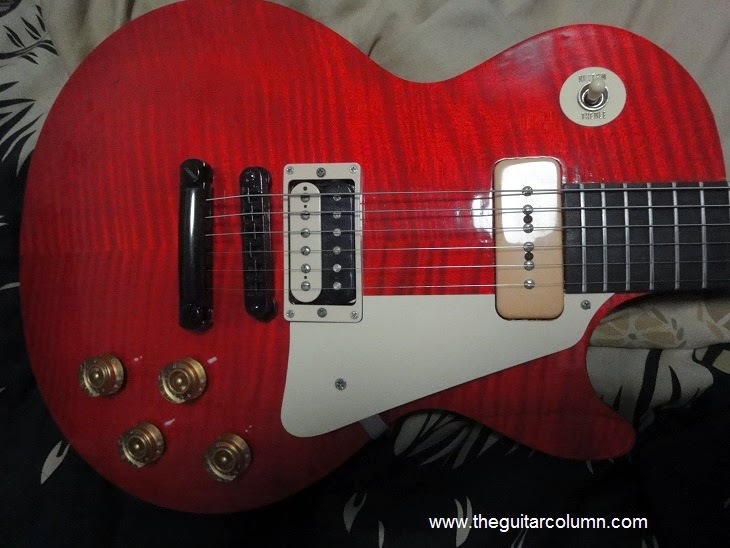 In place of where the neck pickup tone control would be, Gibson elected to situate the 3-way pickup selector switch. And this is the main reason why I so wanted my Les Paul BFG rewired. Where the selector switch would normally be on a conventional Les Paul, Gibson, in all their unfathomable wisdom, chose to add an on-off 'killswitch'. Flipping the killswitch on and off rapidly creates an auditory version of a flashing strobelight, pulsing in rhythm to the music. Or out of rhythm, depending on who's playing. I found the killswitch to be about as useful as a piece of gum stuck under my shoe. 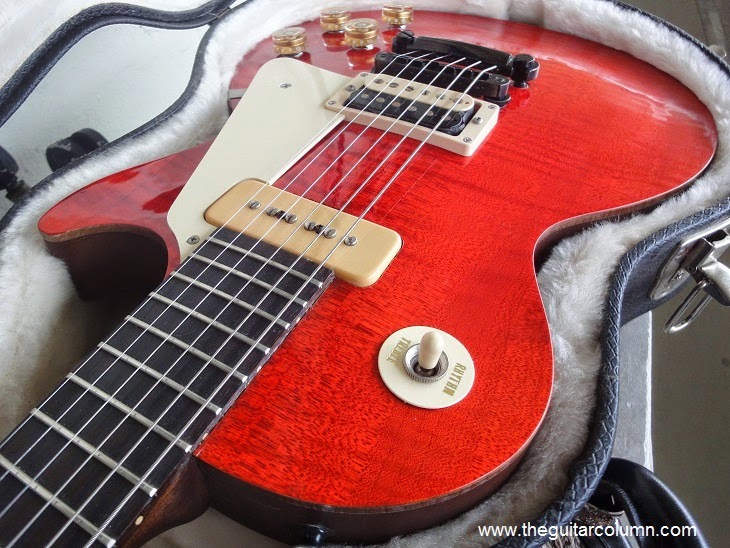 During the first couple of gigs with the Les Paul BFG, I found myself instinctively flipping the killswitch when I really intended to change pickup positions. The first time it happened, the guitar went dead silent and I actually panicked for a microsecond before I flipped the killswitch back to the 'on' position. I'd made up my mind. Someday I was going to rewire this thing to regular -- some might say boring -- old Les Paul specs. 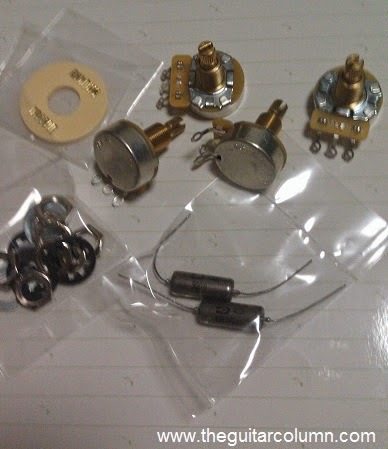 My other good buddy Sherman (who regular readers will remember as a recurring figure on The Guitar Column) suggested that I get a new set of CTS 500k audio taper potentiometers -- 'long shaft' he emphasized, with a wink and a nudge -- and a pair of Russian .022 mf paper-in-oil capacitors. It was all pretty much Greek to me, but shopping for parts I went. But I did know to also get the cool, cream plastic ring that said 'Rhythm' and 'Treble' on it for the selector switch. And a custom-made pickguard by MojoAxe. 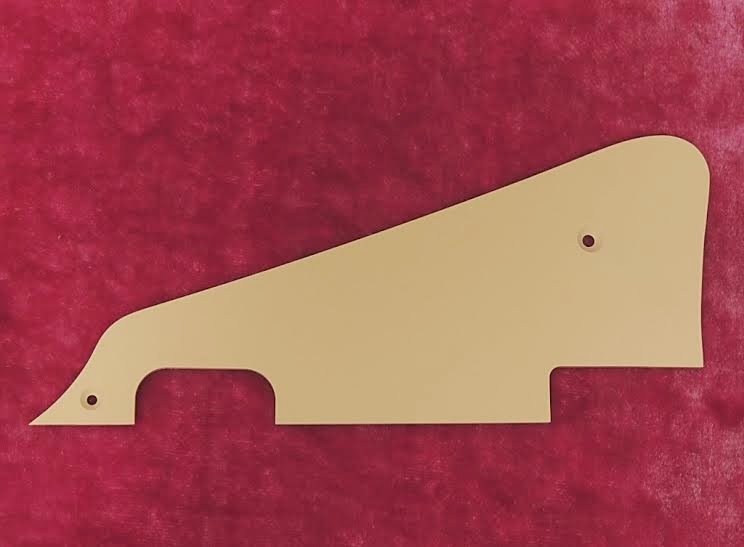 Sherman turned me on to MojoAxe, mentioning that they produced the most material-accurate plastic parts that even vintage Les Paul owners would turn to when they needed to get a spare pickguard or control cavity cover. MojoAxe also makes a well-intonated wrap-around replacement tailpiece for old and reissue Les Pauls. And since the Les Paul BFG had a P90 soapbar in the neck and a humbucker in the bridge, MojoAxe would also be able to cut a custom pickguard for me. Dealing with Dan at MojoAxe was an absolute pleasure. 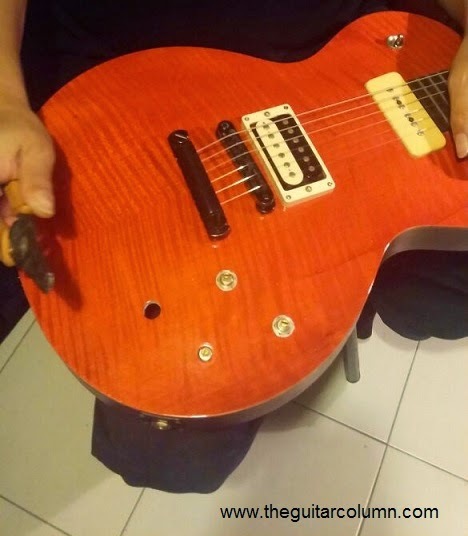 He asked for the measurement between the neck and bridge pickup and had the pickguard cut and mailed out the following day along with an aged nickel mounting bracket and screws. He even sent me the picture you see here before mailing it out. But back to the wiring. And a couple of potential problems. 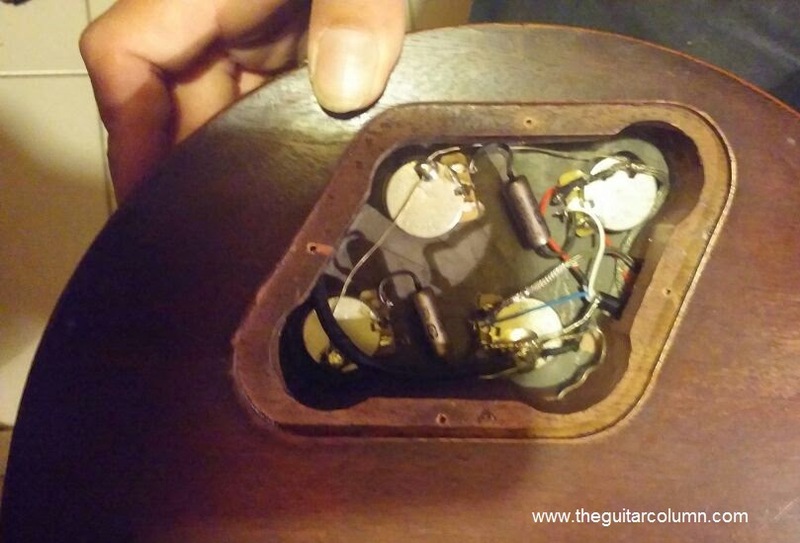 The first thing we noticed when Arnold removed the original Gibson potentiometers and the 3-way selector switch was how much larger the hole drilled for the switch was. Remember that on the Les Paul BFG, the selector switch is located where the tone pot for the neck would normally be on a regular Les Paul. I was a little worried because the tone control for the neck pickup was going to be re-situated there and that the hole would be too large to hold the pot in place. Fortunately, the metal washer that held the nut for the tone pot was wide enough to cover the hole entirely. The second thing we noticed was the unusually long pickup selector switch used on the BFG. Unlike the usual Switchcraft switch used by Gibson, this switch was a good 1/2" or so longer. Again I was worried that the switch would be too long for the cavity where the killswitch originally was. Fortunately again, the plastic selector switch cavity cover fit over nicely, but in full contact with the square base of the switch. No problems there. And did I mention that the Les Paul BFGs come with these cool clear acrylic covers for both the pickup selector and main control cavity? The original killswitch came mounted on a nice, sturdy countersunk metal barrel that held the switch very solidly in place. After all, if one was to go ape with the killswitch all the way through a show, it had better be solid. This metal barrel also fit the 3-way selector beautifully, but because of its slightly larger diameter, Arnold had to file and enlarge the hole of the plastic Rhythm-Treble selector switch ring. The cream plastic ring is purely cosmetic, I know, but I felt that the guitar would look incomplete without it. Les Paul forums for their sweet tonal properties. They weren't that cheap but a definite improvement nonetheless, on the matte-orange .022 ceramic caps that came with the guitar. And as you can see in the pic, Arnold very thoughtfully applied rubber heat-shrink insulation to each leg of both capacitors. 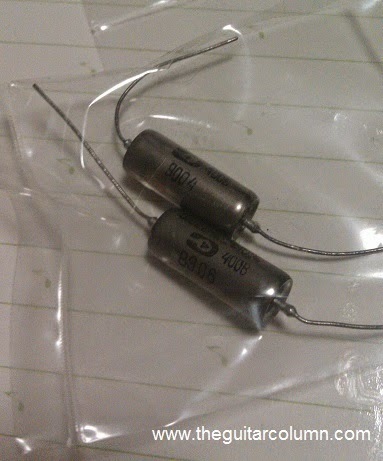 If you're interested in these Russian vintage capacitors, the part number and description for them is K40Y-9 PIO (paper-in-oil). They come with a dark silver body and have just a +/-10% tolerance variance. Arnold then asked me if I wanted my guitar wired in the 'modern' style or with traditional 50's wiring. These things always give me a case of option anxiety. Consulting the Oracle Of All Things Gibson (the entity also known as our good buddy Sherman), he recommended going with the 50's wiring for more twang and clarity -- muddy-sounding Les Pauls, he said, usually came with the so-called 'modern' wiring. And with the P90 in the neck position, traditional 50's wiring would bring out the bright single-coil qualities of that pickup even more. It's nice to have friends who know stuff! Les Paul traditional 50's wiring. Very neat work! Arnold proffered a practical solution to my conundrum and said that he would wire the guitar with 'modern' wiring, and then switch to 50's wiring to compare. Apparently, it was just a matter of moving one of the legs of the capacitors to a different lug on the potentiometer. 'Night and day' is probably the best way I could describe the difference between the two wiring schemes. The modern wiring sounded like how you would expect a Les Paul to sound -- fat and creamy, with the notes in a chord just melding together. If you were playing heavy-rock or metal, the modern wiring would probably be more suitable. The traditional 50's wiring brought out a lot more clarity and and brightness. You could hear each of the notes in a chord, even through a distortion pedal. Single notes popped more, and had more definition with richer overtones. You could hear the string as you played. Another thing I noticed was that the volume and tone pots seemed more responsive. Playing through a Chandler Tube Driver with the gain up three-quarters (which is a ton of gain), I immediately noticed that rolling back the volume controls on the guitar to 3 or 4 cleaned up the sound considerably. Also, rolling the tone controls back, even to zero, didn't make the sound muddy or woofy. And the combination of using the neck P90 pickup and rolling the tone control back to 4 or 5 put me squarely in Grant Green-Wes Montgomery territory. I was convinced -- 50's wiring it is then. So, after about a month and a half of working on my Les Paul BFG project, we have reached the point where the guitar is probably more traditional Les Paul than BFG! The guitar is light, probably from having all that wood shaved off the top, resonant, and a joy to play. No surprise that it has taken on a different personality from its previous incarnation. And it is loud acoustically. A lot louder than it was before. Sherman probably said it best, "I don't remember your guitar sounding this good." Pretty cool, coming from someone who used to sing in a club band every Monday and Thursday night for years with me playing this very same guitar! And if you haven't already, be sure to read Refinishing My Les Paul BFG Part 1, 2, 3 and 4 and my Interview with luthier Luca Quacquarella. Also, be sure to visit mojoaxe.com for the best in Les Paul parts.